Thursday marked the first official day of winter, but seasons don’t mean a thing when you’re Beyoncé. 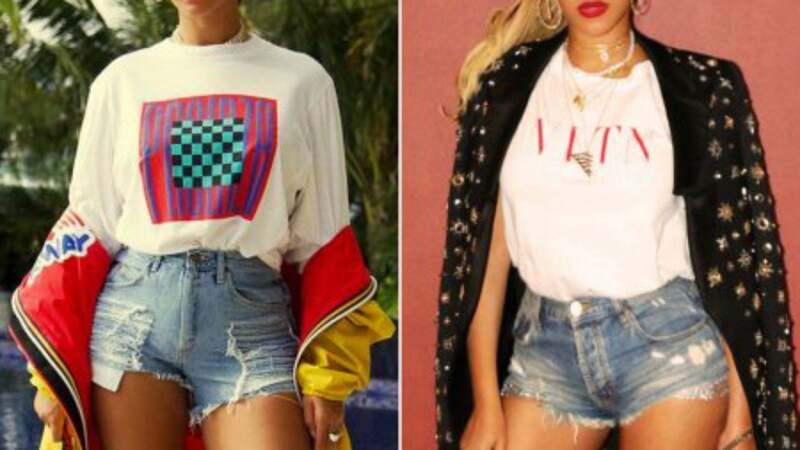 The songstress continued her incredible string of post-pregnancy style moments in her latest Instagram posts, donning two looks centered around denim shorts that flaunted her toned legs. Saturday’s look featured a white long-sleeved t-shirt under a yellow jacket with red lining that Beyoncé let hang off her shoulders as she posed beside a pool in a tropical detination. She glammed up the ensemble with a light blue Louis Vuitton bag, sunglasses and hoop earrings. For footwear, the singer paired red open-toed heels with pink socks. One photo featured a close-up of Beyoncé’s hands, with the star rocking accessories on both her ring and middle fingers. The shot also displayed her altered wedding tattoo — Beyoncé and Jay-Z got Roman numeral IVs inked on their ring fingers after they got married, but some fans noticed the ink fading in 2014 before reappearing with additional lines. The slightly obscured art makes the original IV look a little more like a numeral 4 or a capital J. The mom of three was back at it again on Sunday, sharing another round of photos in a new outfit. This time, the denim shorts were accompanied by a t-shirt and black jacket with embellishments slung over her shoulders. Beyoncé wore her hair — perhaps her natural locks — in a high ponytail and layered up on necklaces. She further accessorized with red heels and a pair of round shades. JAY-Z even made an appearance in one shot of the couple walking down a hallway with their backs to the camera.